I learned how to make sourdough bread several years ago. That was such a great skill to learn! 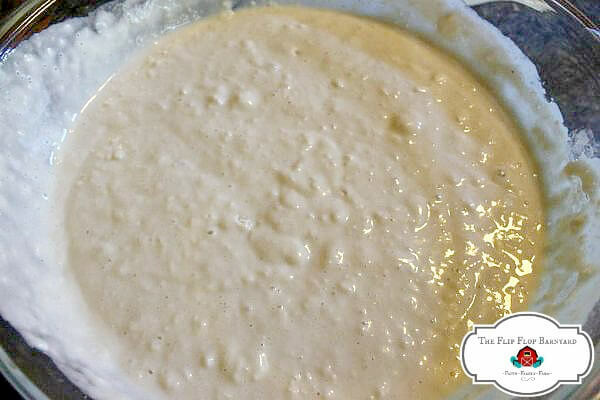 I started out with an Alaskan Sourdough Starter Culture to make my own sourdough starter. I finally tweaked my own sourdough bread recipe for perfection. Did you know that commercial yeasts didn’t become available until about 1870? Did you ever wonder how bread was made before this time? People used to “catch” wild yeasts for bread baking. 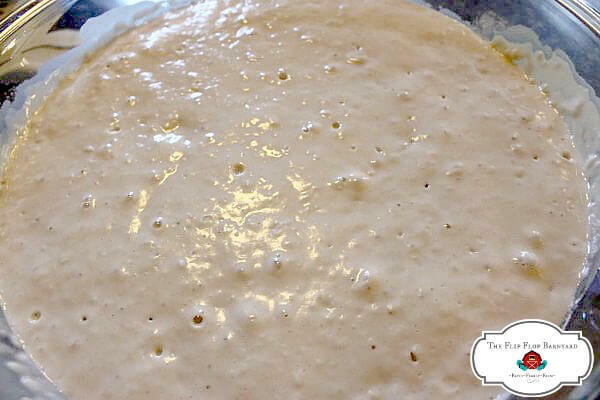 This is a simple method of mixing equal parts of flour and water and feeding it every 12 hours until the mixture catches its own yeast and the yeast begins to reproduce. They knew it was ready when the bread was bubbling reliably, thus creating their starter. Once one had a reliable starter they would maintain it constantly, sometimes throughout generations. Some of those starters still exist in the same families, hundreds of years later. That’s pretty cool as far as I’m concerned. Sourdough is a very traditional bread. Some of today’s sourdoughs are not “true” sourdoughs as they have yeast added to make them rise quickly. Making sourdough in a traditional method with long rise times gives the dough time to ferment and do its job. The fermentation process causes the bread to be more digestible, more nutrient dense, and in my opinion, more filling. 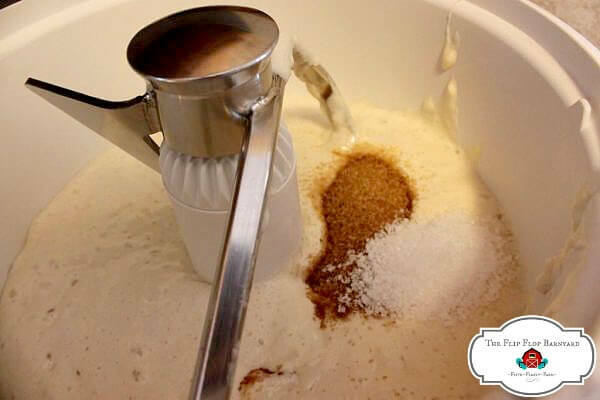 The fermentation also breaks down the sugars in the flour so they do not react so extremely with your blood sugar levels. We have been enjoying this ever since I learned how to make sourdough bread. It tastes so good and is so much healthier than breads baked with commercial yeasts. This has been a great option for our family. I have been making bread 1-2 times a week. I refrigerate my sourdough starter in between bread days so I do not have to feed it as often. I set my starter out to warm up and feed it 2-3 times before I’m ready to bake with it. I have been using organic unbleached flour most of the time with my starter. I bought my Alaskan Sourdough Starter and it requires the white flour for feedings. I have used fresh ground wheat with the starter for my bread but have found that it is a much stronger flavor and my family doesn’t particularly enjoy it. I will just stick with the white flour until I can work on making it milder with the whole wheat. Update: Since writing this post, we have switched to using spelt wheat and will be making sourdough with it soon. I start out by mixing up my sponge. 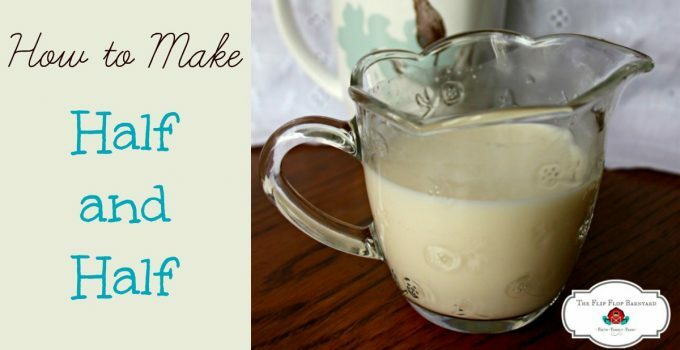 I do this by mixing 2 cups of active starter, 3 cups of room temperature water, and 6 cups of flour in a very large glass bowl. I stir this all together very well to be sure everything is incorporated. Let stand covered (I set mine in the unheated oven) for 2-8 hours. I usually stick to about 2 or so hours. When the sponge is ready it, should have expanded and be actively bubbling. Sponge after it is mixed ready to sit for several hours. Sponge bubbling and ready to mix into dough. After the sponge is ready, I pour it into my mixer and add 2 tablespoons each of sea salt and demerara sugar. I let that mix in and then slowly add 4 cups of flour. 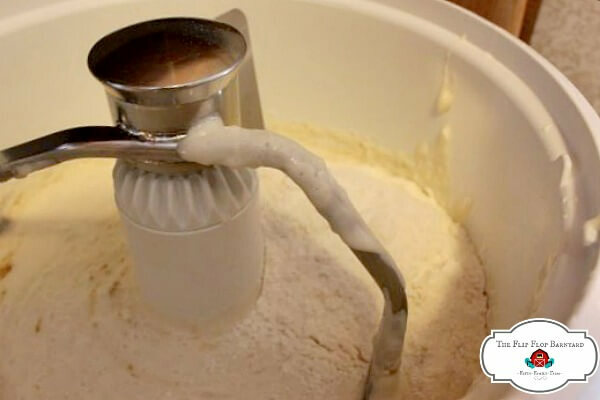 I allow this to knead in my mixer for 3-4 minutes. I oil the bowl (with olive oil or coconut oil) from the sponge and place my dough in the bowl, turning it to coat with oil. I allow this to stand loosely covered for 1-2 hours until almost doubled in size. 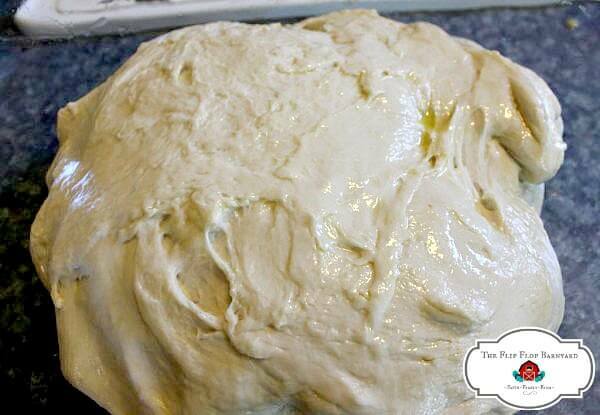 Once my dough is close to double in size, it is now ready to be formed into loaves and placed in the oiled loaf pans. This time, I allow it to rise 1-2 hours or until dough is about 1 inch above the bread pan at its peak. I bake it in a pre-heated 450° oven for 20-25 minutes until golden brown on top. I found that in my oven I have to lower the rack to one level below the center rack in order to keep the tops of the loaves from cracking and getting too brown like in the photo below. All ready to slice and slather in butter! 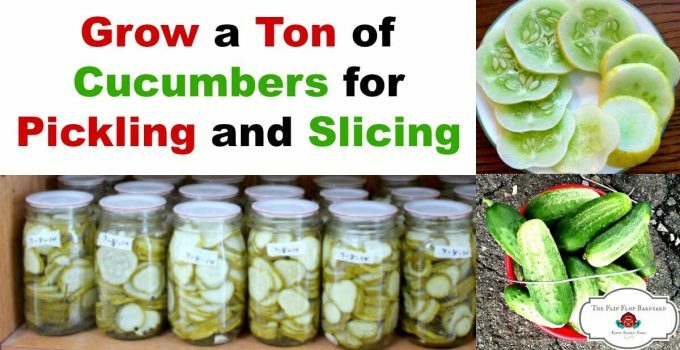 This may seem like quite the process but it really is simple. I just set my timer for each rise time and get other things done in between. I am so happy that we decided to start using sourdough all of the time. I hope you will try your own sourdough and share you progress with me! This is the best traditional sourdough recipe around. The texture and flavor of the bread are just perfect! Mix Sourdough starter, water, and 6 cups of flour thoroughly in large bowl. Allow to sit for 2-8 hours until actively bubbling. Pour sponge into mixing bowl, add sea salt and sugar. Slowly knead in remaining 4 cups of flour and continue to knead for 3-4 minutes. Place dough in well oiled bowl, turn to coat dough with oil. 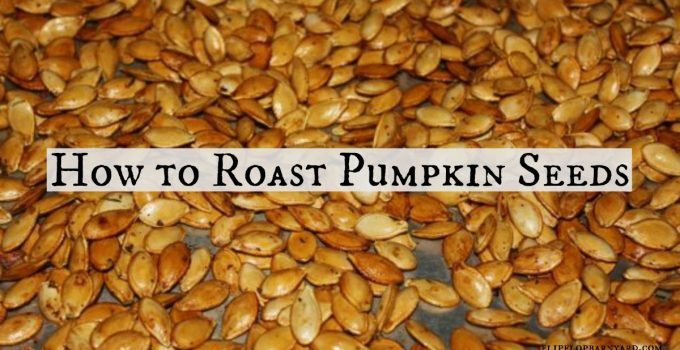 Set aside to rise for 1-2 hours or until doubled in size. 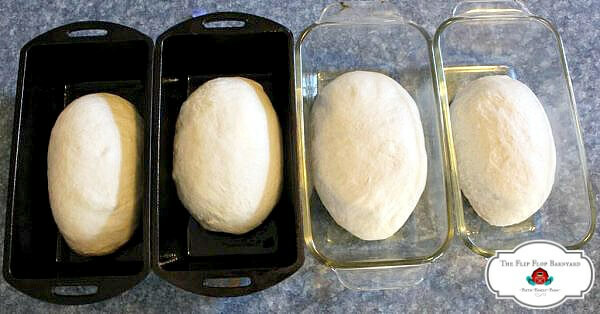 Form dough into 4 loaves and place in oiled loaf pans. Set to rise 1-2 hours until dough is about 1 inch above the pan sides. 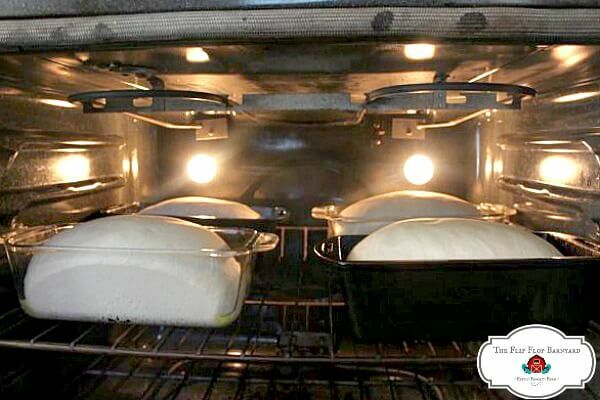 Place in preheated 450º oven for 20-25 minutes until golden brown. 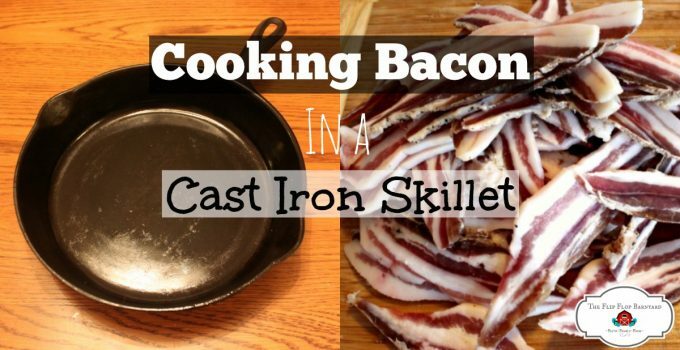 Thanks for linking up over at the Talented Tuesday Link Party! Thanks! It’s yummy. 🙂 You should try it sometime. We lived in Alaska for 6 years where sour dough is the national bread. Everything is made from sour dough. Best pizza I ever had was in Alaska made with a sour dough crust. This looks so good! 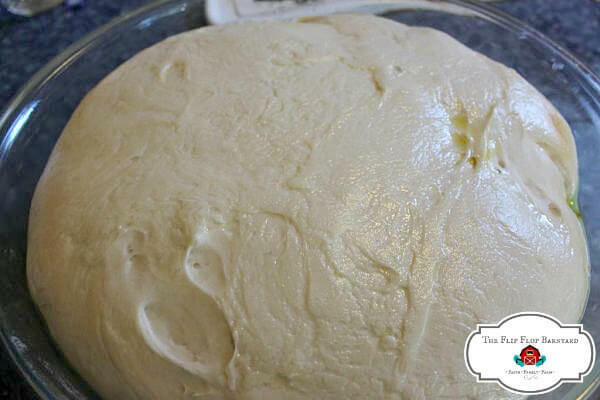 I’m still nervous about yeast breads so this might be a little over my head but I’m definitely pinning for later! do you have to send away for the cultured yeast, or can you buy it here somewhere? I can’t wait to make this. 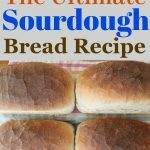 Sourdough bread is our favorite but I haven’t ventured into making it. 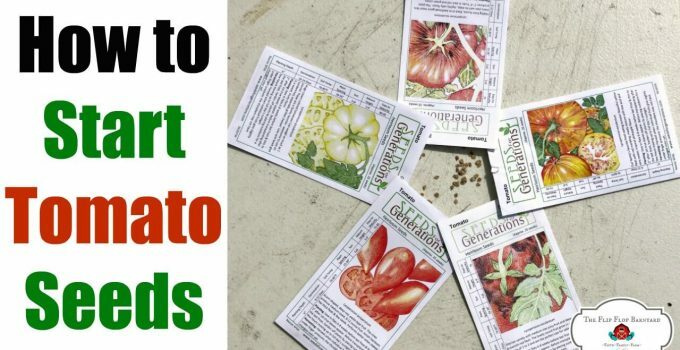 Thanks for posting such a detailed post on how to make it. Jenna, thanks I’m gonna go into the website and order some, we love Sour Dough bread and if I can make my own, that would be AWESOME!! Got my starter in Death Valley, CA in 1973, have kept it going 41 yrs. 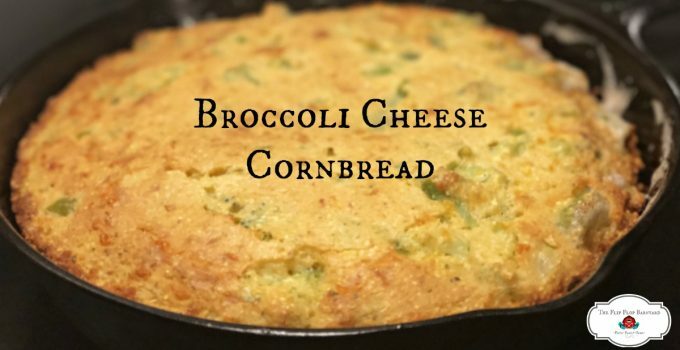 use Sourdough Jack’s cookbook. Makes the best biscuits & English muffins. This is my 1st time doing sour dough. I was looking at the baking temperature is it a higher heat other than the normal 350 temp because of the use of the sour dough? Can I make this without a mixer? 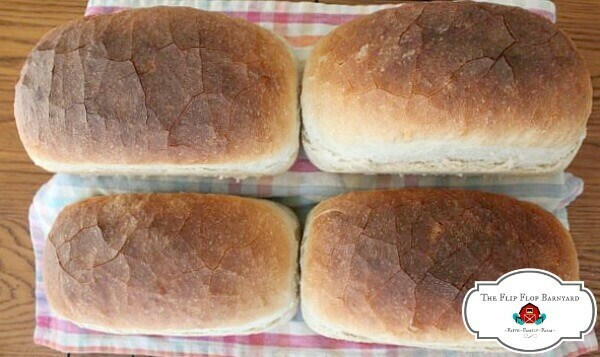 Do you use whole grain for the bread, or white for both starter and bread? The explanation with photos says to use 2 TBS each of sea salt and sugar, but the recipe lists salt at just 2 tsp. Is there a correction for this amount? I know bread dough can be dependent on salt and yeast ratio for a good rise. I used the Tbs because I was reading the how-to with pictures as I measured, and it sounded like a lot of salt! Thanks for any input! I’m sorry for the confusion, It should be 2 TB of each. 2 TB is for 4 whole loaves. 🙂 I edited the recipe to correct it.